Pebble has updated its Android app to version 2.3. 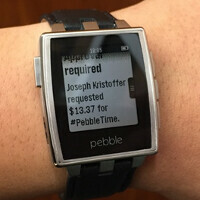 With the update, Android users will be able to respond and act on notifications directly from their Pebble. That's right, the Android 2.3 update for Pebble brings Android Wear notification compatibility to your Pebble smartwatch. Some of the new things that Pebble can do after installing the update, are features that Android Wear watches cannot even do. With your Pebble smartwatch, you can send cash to a friend who sends you a Square Cash request. You can even use an emoji to respond to a Hangouts message. To receive the 2.3 update to the Pebble Android app, all you need to do is to join the Pebble Beta Testing Group. Once you sign up (which you can do by clicking on the sourcelink), you will be asked to beta test version 2.3 of the Pebble Android app. You will need to have an smartphone running Android 4.0 or higher in order to use the update. Version 2.3 of the Pebble Android app includes bug fixes, and a way to update apps and watch faces when the timepiece is idle or is charging. It also repairs issues that Pebble users were having with notifications from messaging app WhatsApp. Pebble has sure come a long way from its Kickstarter days, and still remains one of the most popular smartwatches available. Check out the videos below and you'll see why! Is that pebble steel? yup. I didnt read the article. its a darn nice watch. got one recently. I'll be returning my microsoft band.